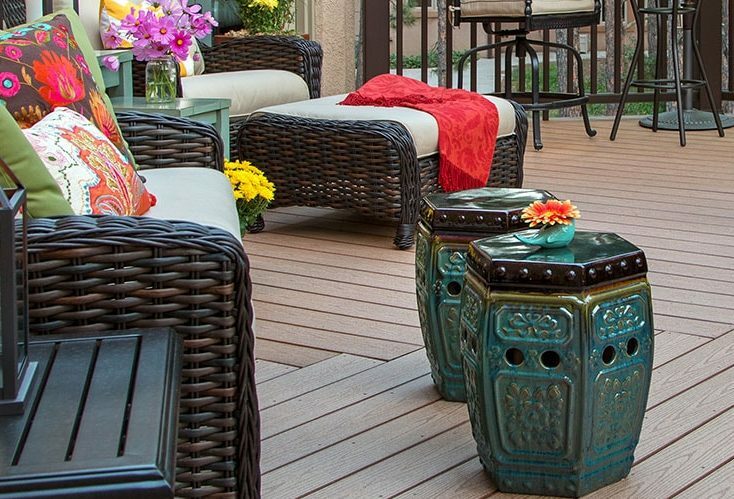 Learn how to clean and maintain your deck for fall. After a long, hot summer, it is almost officially the start of fall! Fall weather brings cooler temperatures, which allows us to enjoy our backyard and deck more during this time of year. Before the weather gets too cold, check out our tips for cleaning and maintaining your deck to ensure you get as much use out of it as possible. If you have a wooden deck, it’s important to make sure it is waterproof. Wood is more susceptible to water damage, which can result in a ruined deck. A significant part of maintaining a wooden deck is frequent sealing, and the beginning of the fall season is a great time to apply another coat of sealant. Remember to clean your deck before the sealing or staining process, and check with a contractor to ensure you are using the best sealant for your wood deck. Everyone looks forward to the transition from summer to autumn as the leaves change color and cover the ground, but they shouldn’t stay on your deck. After leaves, acorns, or pine needles have started to fall, be sure to sweep them away before they get stuck between boards and start to decay. If the branches above your deck look unsteady, the beginning of fall is a good time to trim them back. If you haven’t taken care of your trees before the first snowfall, there is a greater risk that snow will weigh branches down and cause them to break off. Trees can cause a lot of damage to your deck, so it’s better to deal with overhanging branches now before anything goes wrong. Fall is one of the best seasons for spending time outdoors, and what better way to enjoy the crisp air than relaxing in your own backyard? The nights will start to get chilly soon, so it’s time to make some changes from your summer decorations. Add comfortable pillows and blankets, a TV and grill for football watching parties, and pumpkins and gourds for Halloween decor. However, be careful not to place the pumpkins directly on your deck, as the moisture can contribute to rotting wood. This entry was posted on Thursday, September 20th, 2018 at 4:17 pm. Both comments and pings are currently closed.